Exceptional cities need peculiar architecture, according to their characters and ambitions. Without the slightest doubt Sarajevo “is” unique in the face of diversification. The idea by Groleger Arhitekti to create a building, a “diptych”, a merging tower based apparently on two independent volumes, started by a profound analysis of the urbanistic, cultural and social factors of the City of Sarajevo. 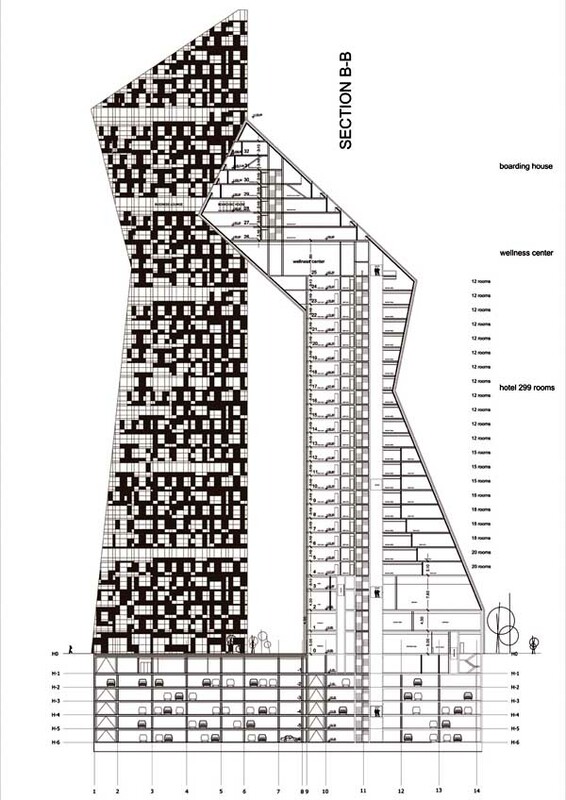 The result is a metaphorical and encoded building encompassing all environmental influences. The form of the skyscraper is the logical result of the parameters concerning the exposed position of the future development. The property is located in the geographical centre of Sarajevo, in the district called “Marijin Dvor”. This area is known as the administrative and business district, built up with high-rise, the Parliament and several important administrative buildings. The emerging structure is formed by convergence of two identical tetragons in space. The dual composition allows for common vertical communications core linking the volumes to each other introducing various new modes of flexibility within the individual floors vertically and horizontally. The result is an elegant, one hundred metres high skyscraper of architectural diversity and uniqueness. 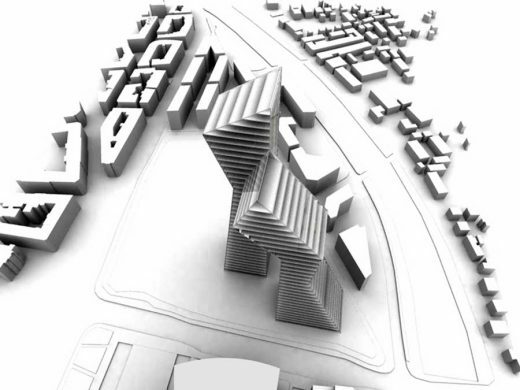 The slim shape of the tower is implied by existing forces detected in the city of Sarajevo like view axes and apertures to the riverbanks of Miljacka. 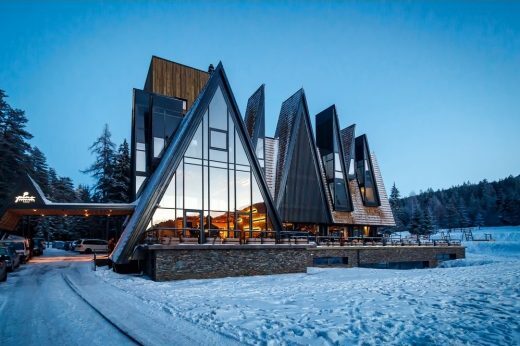 The facade reflects the philosophy and the logic of the adjacent morphology. Capturing the passepartout delicate structure of the surrounding hills with the embedded carpet of existing dispersed housing and translating it into the facade a unique pattern of open and closed spaces was developed that diversifies the building envelope into a very dynamic picture. 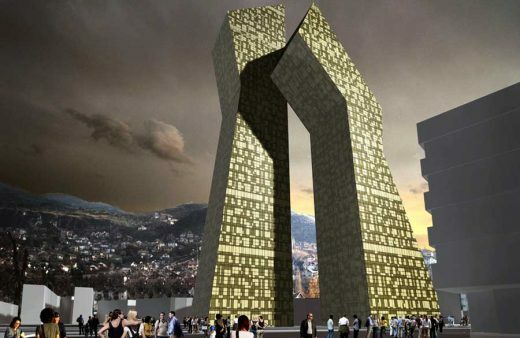 The aims of the project are to create a hot spot in downtown Sarajevo, a flag-ship project to revitalisation of Sarajevo’s urban life and to set a standard for future projects in this area while respecting the neighbouring parliament and establishing a linking path between the administrative and the public through “our” building. The new development will be a starting point for guided tours along the Miljacka river banks to the historical city center of “Bascarsija” and a prime destination for culture, entertainment and shopping.